2 What is the Membrane Made of? Cell membranes are responsible for a variety of important functions within the body, such as allowing control of the enclosed environment. In this article we shall consider the main functions of the cell membrane, the composition of membranes and clinical conditions in which a portion of the cell membrane is abnormal. In a cell, different parts of the membrane have different functions and therefore their structure is specialised for this. An example of this specialisation can be seen in the different parts of a nerve; the cell membrane in the axon is specialised for electrical conduction whereas the end of the nerve is specialised for synapsing, meaning the composition of the membrane is different. What is the Membrane Made of? As functions of cell membranes vary, their composition is also slightly different in different areas. The membrane bilayer contains many phospholipid molecules. These consist of a head molecule, a phosphate molecule, a glycerol and two fatty acid chains. between 14-24 carbons (but the most common carbon lengths are 16 and 18). If the chain contains a cis double bond then the chain is kinked – therefore reducing the tight packing of the membrane and so increasing its movement. As the tail is made of fatty acids, it does not form hydrogen bonds with water and therefore is hydrophobic and non-polar. 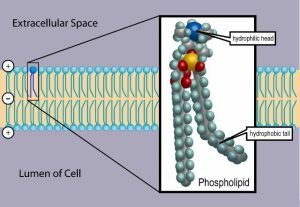 Phospholipid molecules are therefore amphipathic – being both hydrophilic and hydrophobic. They spontaneously form bilayers in the water with the head groups facing out and the tail groups facing in. In the bilayer, there are van der Waal forces between the fatty acid tails of the phospholipid, with electrostatic and hydrogen bonds between the hydrophilic groups and water. 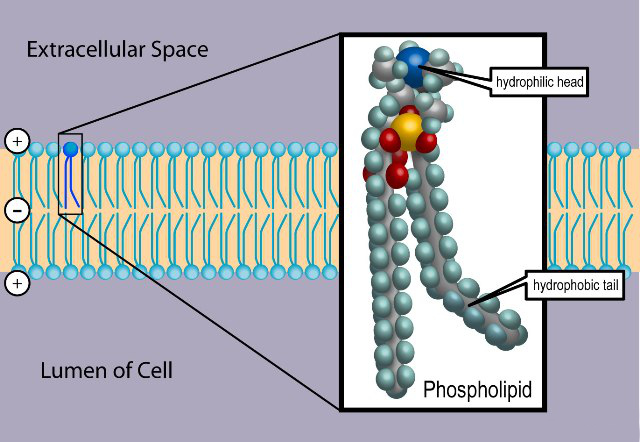 Fig 2 – Diagram showing the structure of both the phospholipid bilayer and an individual phospholipid. Cholesterol is vital for many functions in a cell, including very importantly, a major constituent of the cell membrane. Cholesterol itself consists of a polar head, a planar steroid ring and a non-polar hydrocarbon tail. Cholesterol is important in the membrane as it helps to maintain cell membrane stability at varying temperatures. Cholesterol is bound to neighbouring phospholipid molecules via hydrogen bonds and therefore at low temperatures, reduces their packing. Overall this means at low temperatures, when rate of movement is lowest, a fluid phase is maintained. At high temperatures, cholesterol helps to stop the formation of crystalline structures and the rigid planar steroid ring prevents intrachain vibration and therefore making the membrane less fluid. More active cells or organelles e.g. mitochondria, tend to contain more proteins, showing again that specialisation of function determines structure. As part of the cell membrane, proteins can either be deeply embedded within the bilayer (integral) or be associated with the surface of the cell (peripheral). Hereditary spherocytosis is a condition in which spectrin, a peripheral cytoskeletal protein, is depleted by 40-80%. There are both autosomal dominant and recessive forms of the condition, with differing severity. As a result of this lack of spectrin, erythrocytes cannot effectively maintain their biconcave structure, and assume a spherical shape. This decreases their ability to travel through the microvasculature of the body and results in increased erythrocyte lysis. 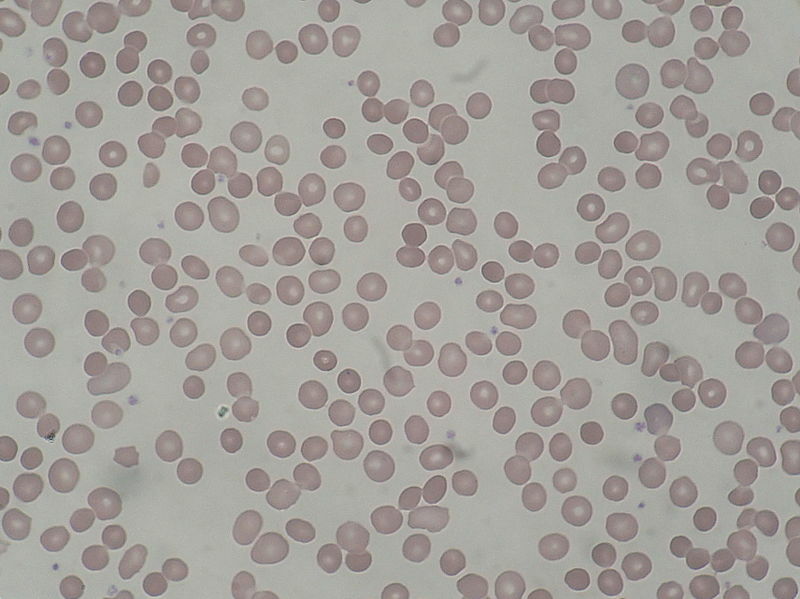 There are 3 other types of spherocytosis that result from defects in ankyrin, band 3 and protein 4.2, however spectrin is the most significant. Fig 3 – Diagram showing a peripheral blood smear from a patient with hereditary spherocytosis. Which of the following is not a function of the cell membrane? What makes up the largest proportion of the cell membrane? What is the membrane bilayer made of? Why is cholesterol important in the cell membrane? 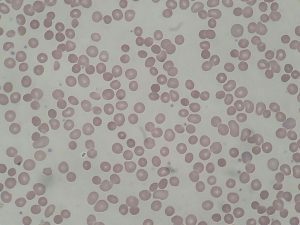 What is the problem in hereditary spherocytosis?